Welcome to the World of Tupperware! 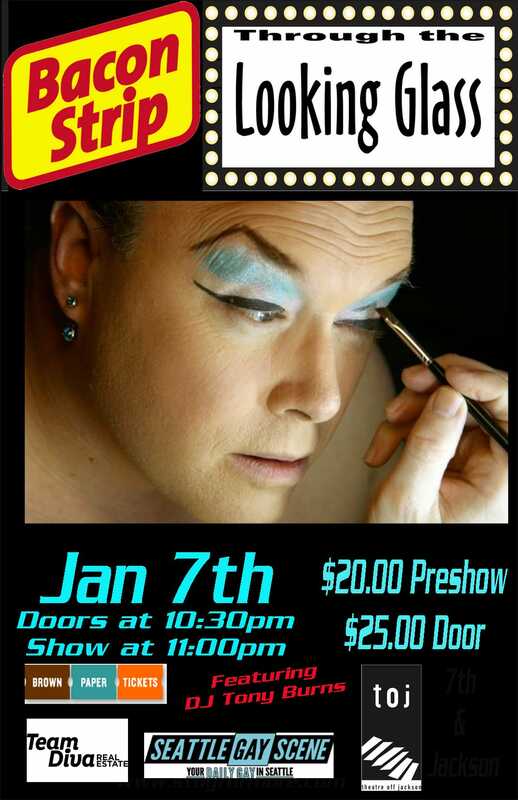 Through the Looking Glass - Bacon Strip Jan 7th - Drag Show for the artists! For the first time ever in the herstory of Bacon Strip we are doing a six-day run! 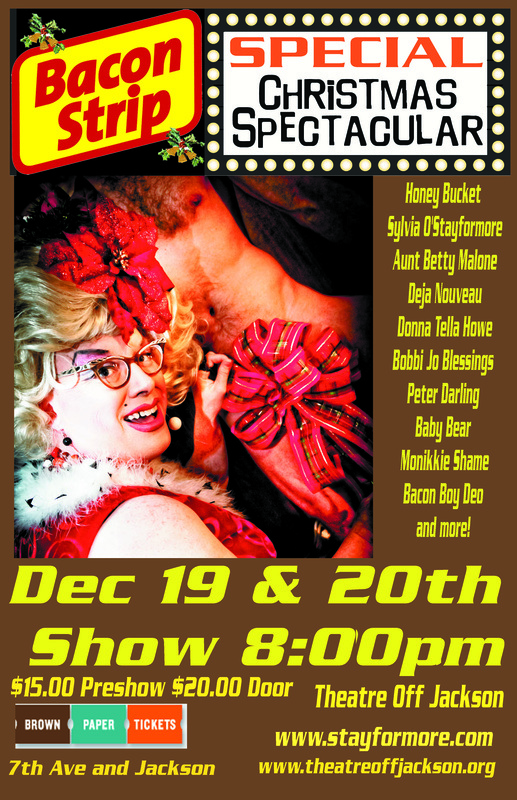 Sylvia’s Christmas Gifts is the Christmas variety show for those who like things a bit off beat. 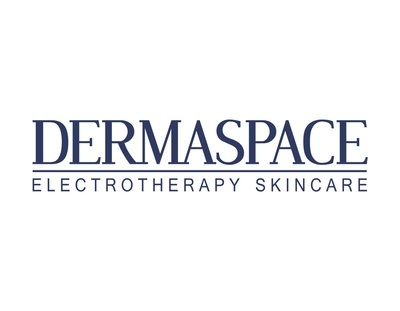 Sylvia is booking some new faces and some wonderful favorites. 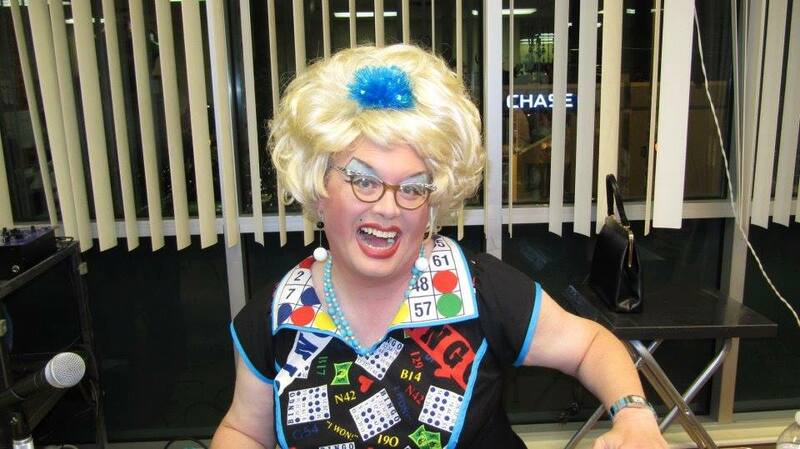 This year Sylvia’s Christmas Gifts will be bubbling over with talent and holiday cheer. 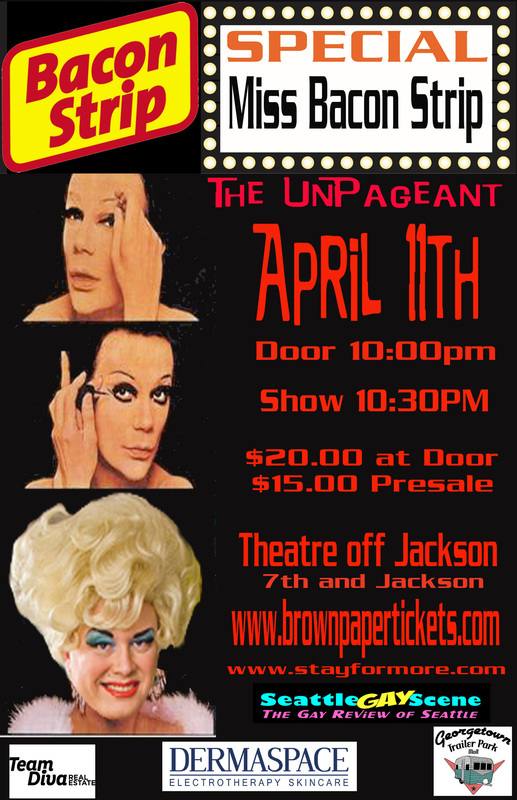 Each night features a different cast! So start a family tradition come join us for International fare and Christmas crazy. 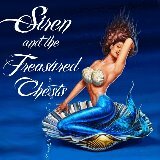 Ticket sale price discounts for the whole run $60.00 for the six shows (Cannot be split up or used for the same show). Our Stage stud for tonight is Beau with Deo as our Meatman. Spinning the hits is our very talented DJ Tony Burns! Bacon Strip SPECIAL Miss Bacon Strip Tickets are a go! 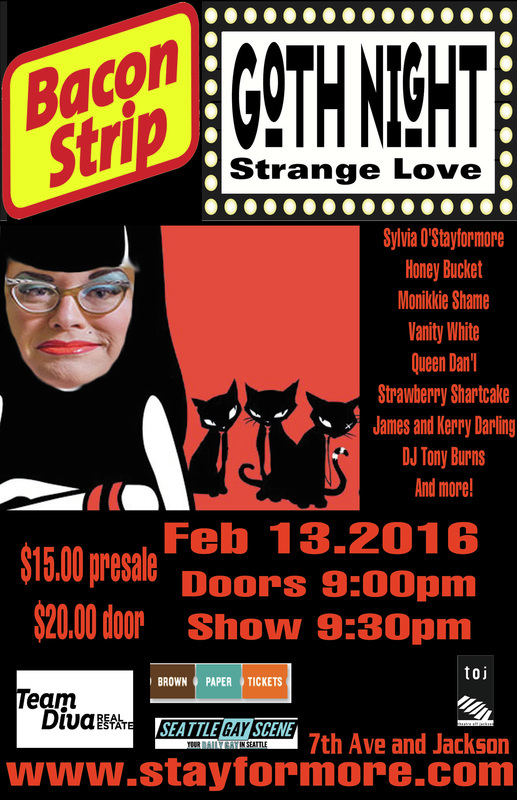 Bacon Strip SPECIAL Goth Valentines Day Show Tickets are up! Next up? 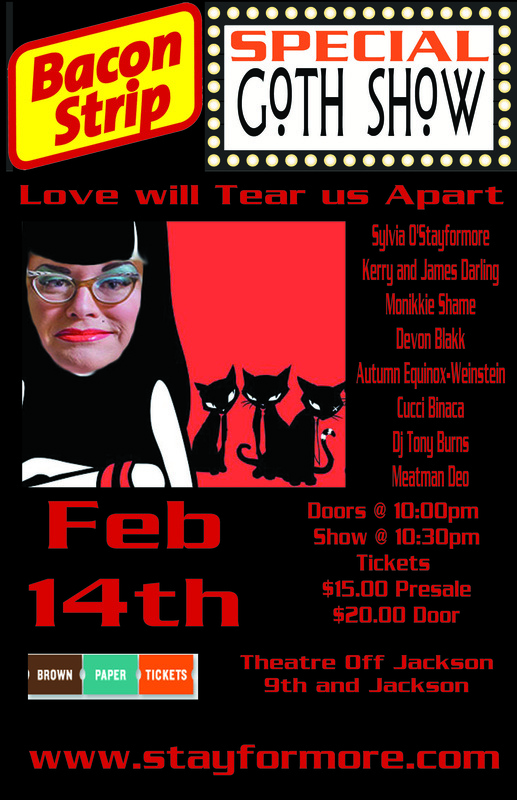 Bacon Strip SPECIAL Goth Valentines Day show! Make sure to mark your calendars for a KISMET of an event. 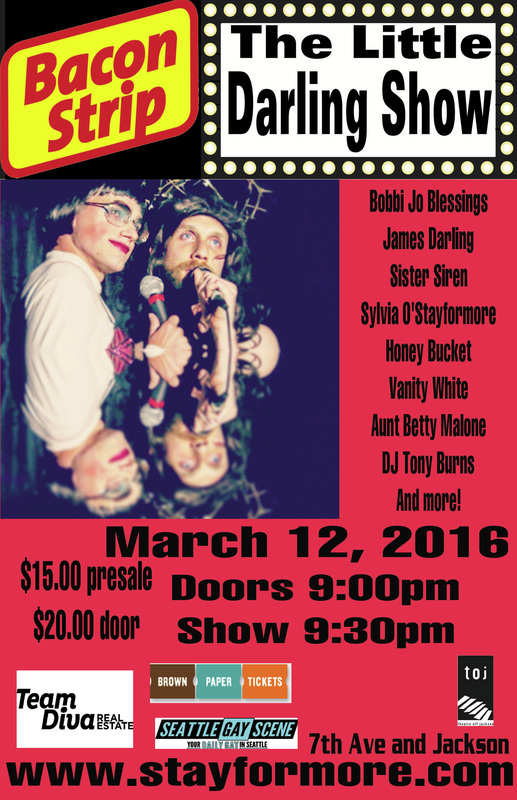 For the first time ever in the herstory of Bacon Strip we are doing a two day run! The crazy mind of Sylvia O' Stayformore has brought together some of the most creative artists in the city to create a holiday extravaganza to go down in the books. We moved the time to an earlier slot and we are going to be playing it for two nights. Dec 19 & 20th at 8:00pm. $15.00 presale and $20.00 at the door. 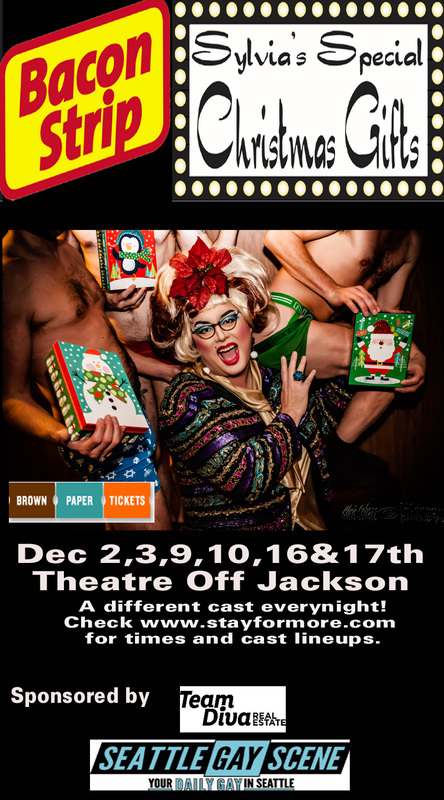 Come down to the International District- Theatre Off Jackson for some Holiday crazy! Parties of 10 of more will also get a discount at the door. Contact Sylvia O'Stayformore for more info. 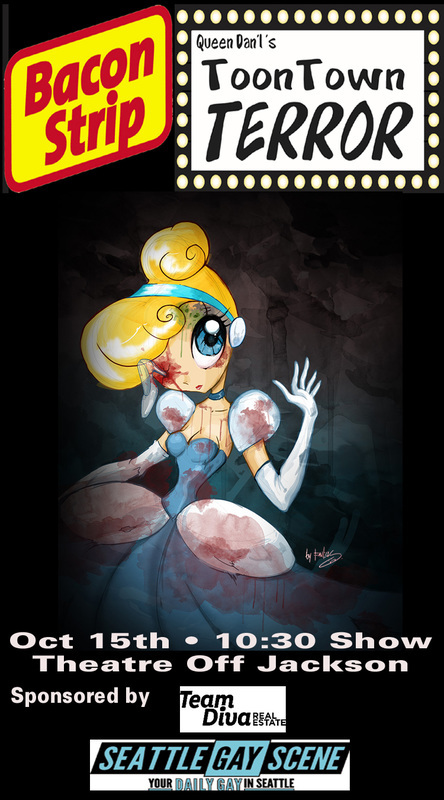 Bacon Strip SPECIAL Sci Fi! What do we have in store? Imagine something like Pigs in Space meets the voyages of Start Trek to the Galaxy of Xanadu! Expect anything. 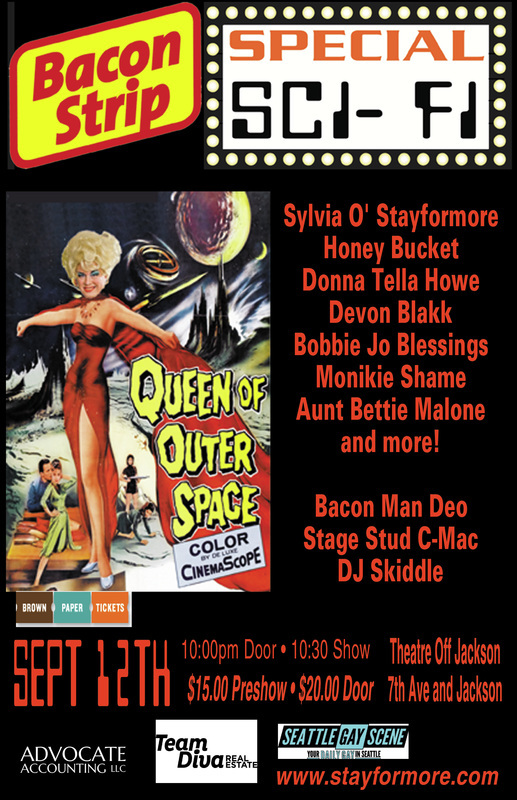 Sylvia O'Stayformore and Honey Bucket, local performers and drag wranglers of the outrageous Bacon Strip, are now happy to bring you Bacon Strip Specials! Quarterly parties of fun, mayhem and bacon! 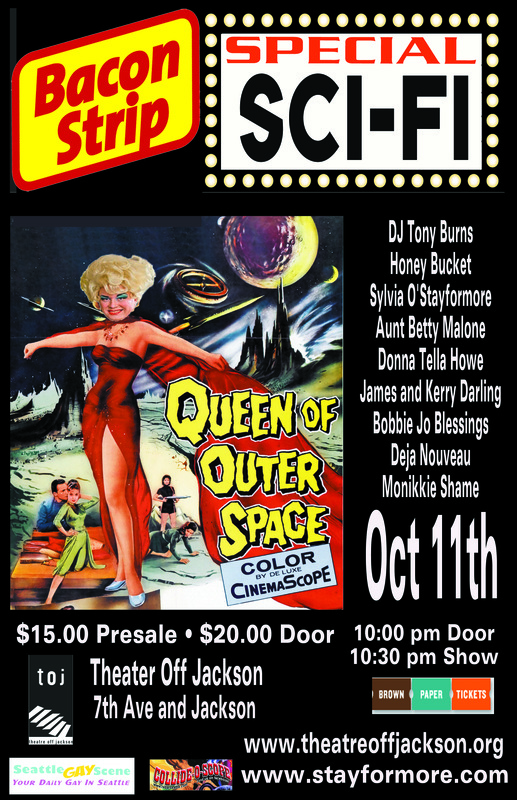 Our first special is Scifi night, October 11th. 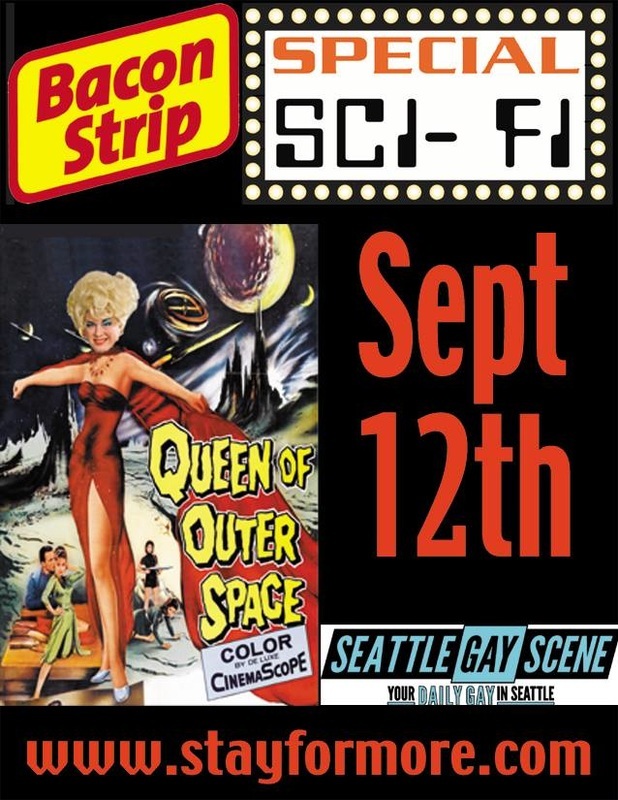 Come down to the International District- Theatre Off Jackson for some Saturday Night fun and transport yourself into the inner dimensions of outer space! A New way of thinking about Bacon! First I want to say, I am so grateful for all of the wonderful people and the talent that everyone has brought to Bacon Strip. Our current show line up is coming to an end in June. While trying to figure out what themes to do for the rest of the year I came up blank. This show has been going through a lot of changes in the past year. This time it’s me that is ready for a change. I am finding that I’m being pulled toward new projects with less and less time to give to a monthly show. So I have decided to end Bacon Strip as a monthly event. This June 14th will be the last of the Bacon Strip shows in our current format. 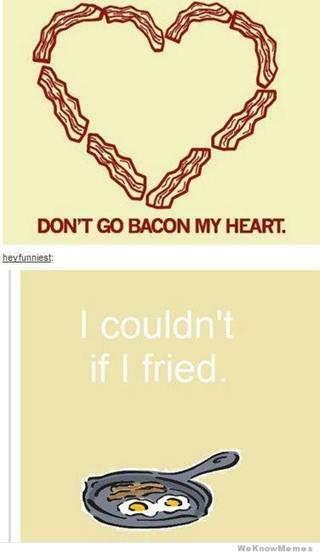 I’d like to make Bacon Strip something new. Perhaps a quarterly party in different locales, I’d also like to look at it as a party option for traveling to other cities. I will always work at trying to do our “Bacon Strip” brand of variety show, making it viable for the producers and artists. The Bacon Strip dream is not dead. I will still be contacting you guys for future Bacon Strip Parties, other productions and events. I want to send out a huge thank you to the huge team of performers, supporters, photographers, videographers, lighting people, sound people, DJ’s and locations that made this night so magical. Thanks to the Italian who never ceased in marketing, promoting and selling. Most of all, thanks to all the fans that motivate us to create something new and original in every single show. 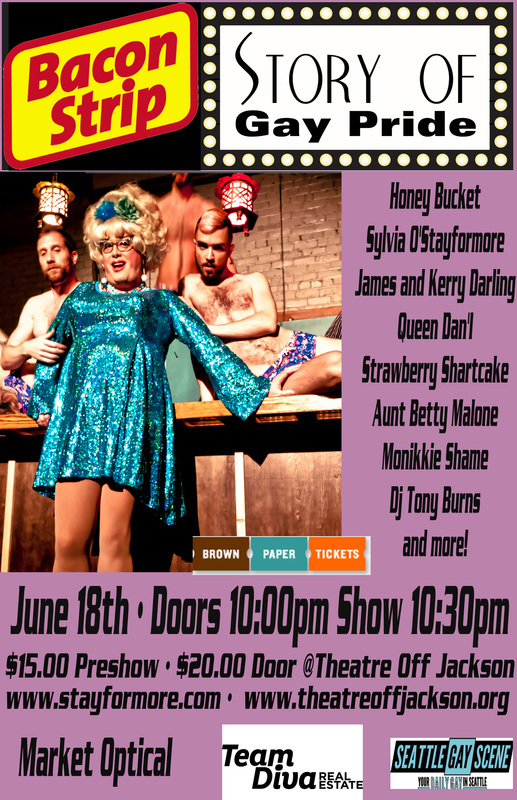 Let’s make this year’s Miss Bacon Strip in May and The Gayest Story Ever Told (Pride Show- Finale’) in June, shows to go down in memory books. 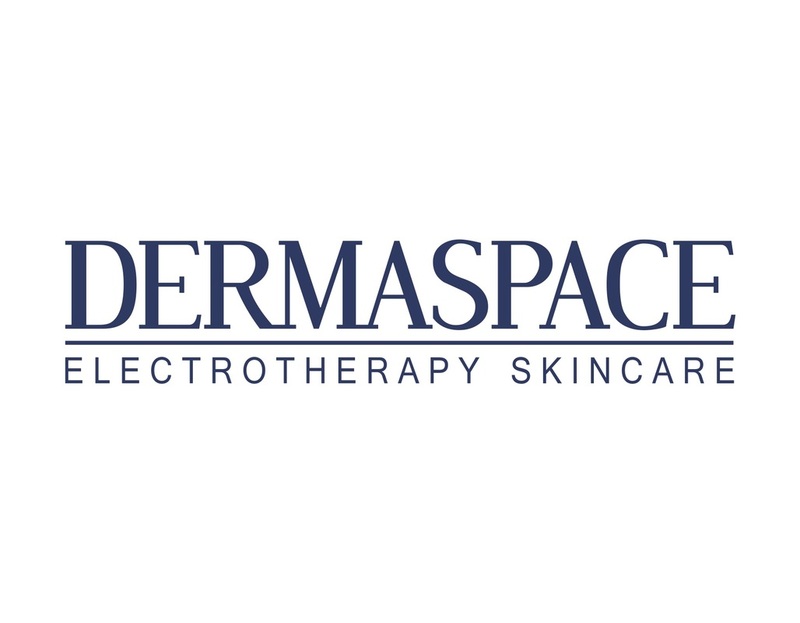 Currently rebuilding to create a new quarterly event.